Richmond's community choir, Madison Singers (which I direct) will present a concert on Monday, March 25 at 7:00 pm at First United Methodist Church. 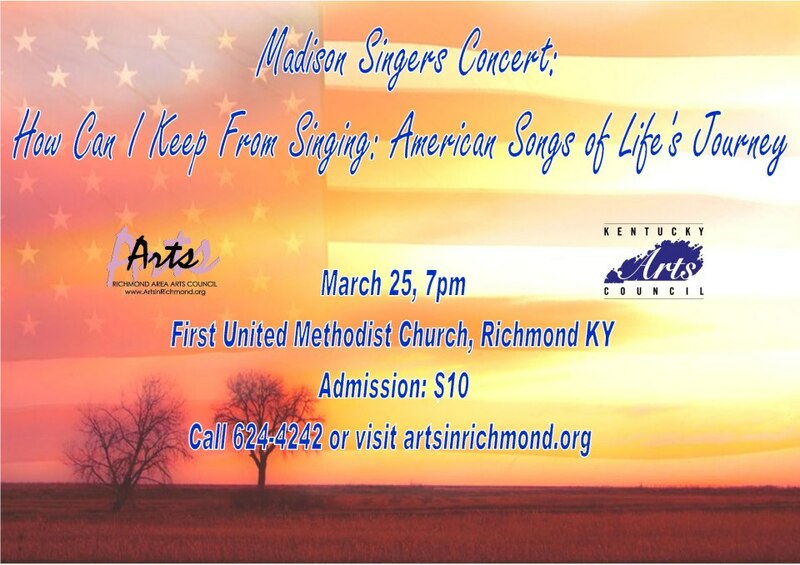 The theme of the concert is "How Can I Keep From Singing: American Songs of Life's Journey." The program is divided into three distinct sections: Faith, Despair, and Hope, featuring music by Randall Thompson, Mack Wilberg, Alice Parker/Robert Shaw, William Billings, Craig Hella Johnson, Dan Forrest, Bradley Ellingboe, and Howard Helvey. Tickets are $10 and may be purchased at the door. I hope to see you there!